New parents often “childproof” their homes when introducing a baby into the house, so pet owners should also be “pet proofing” their homes. Your furry friends are naturally curious and love to explore a new home with their paws and mouths. But they don’t know what’s dangerous and what isn’t, so it’s up to you to make your home a safe haven. This helpful list will help ensure that your pet enjoys a long, healthy, accident-free life. To better protect your dog around the house, screen your windows to guard against falls. Don’t let puppies out on balconies, upper porches or high-up decks. Many house pants, including dieffenbachia, elephant ear, spider plants, and more are poisonous if consumed. Place them in higher areas or remove them from the house. Puppies love to chew on just about anything when they are teething, so hide or conceal electrical cords. Don’t leave a dog alone in a room where there is a fire lit or space heater unattended. Also, beware of leaving plastic bags out, they can be suffocation hazards. If your pet can put something in their mouth, they probably will. Don’t leave small, sharp objects lying around, such as Lego or hairpins. Animals enjoy warm naps near a warm engine so before you drive off, honk the horn or check for animals under the car. Pets also enjoy the taste of antifreeze or windshield fluid, be sure to tighten the caps on these dangerous fluids. Paint, gasoline, and other poisonous chemicals should be stored out of reach. Be sure to never leave burners or hot irons unattended. Dangerous chemicals such as bleach and ammonia should be stored in a safe, high up location. Close open washer and dryer doors when out of use, pets can climb in and become trapped. Keep toilet lids down, smaller pets can actually drown if they fall in. Any personal care items, like shampoo or nail polish, can kill your pet. Keep these stored away properly. Take care of any weeds in your yard, plants like ivy and oleander can be poisonous. 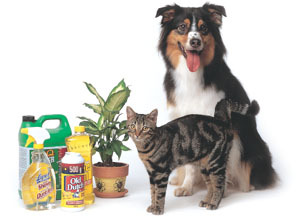 Keep pets away from lawns treated with chemicals or fertilizers. Store garden tools in secure, locked sheds, and cover swimming pools, hot tubs or ponds in case your pet falls in. Eliminate hooks or similar objects located around your dog’s height – the collar can get caught or entangled and he can choke. Always keep track of cars in front of your house when outside in case he/ she runs out into traffic. Christmas decorations, like lights, tinsel, or glass ornaments will be sure to be chewed on, keep these out of reach. Holly and mistletoe are poisonous for your pets as well.